It took two years of lobbying by a dogged grassroots movement and a yes vote at annual town meeting to set the table for the final approval by the Oak Bluffs conservation commission (ConCom) on Tuesday night, for a permit that would allow the use of a beach rake to groom Pay Beach and Inkwell Beach this summer. Although the $40,000 beach rake had already been purchased, and arrived here last week, an unfavorable determination by Stan Humphries, a Department of Environmental Protection (DEP) approved consultant from Plymouth-based LEC Environmental Consultants, would have left the town with a $40,000 paperweight. However, in his 14-page report, Mr. Humphries approved the use of a beach rake for a three-month trial, beginning in July. Based on Mr. Humphries’ approval, the ConCom voted unanimously to grant the permit. Mr. Humphries also approved grading the steep drop that runs parallel to the water on Pay Beach. Ms. Hughes said the results of this year’s trial period should be closely examined over the winter. The ConCom vote was preceded by an hourlong discussion that addressed numerous details — frequency of the raking; the cost of the raking; who will pay for the raking; the depth of the raking; the area of the raking; the minimum size of the rocks that will be raked; and where the raked rocks will go. ConCom agreed on two rakings in July and August, and one more after Labor Day. The rake will go to a depth of four inches, and scoop up rocks ¾ of an inch in diameter at minimum. The area to be raked will extend from the new stairwell at Samoset Avenue to the southern end of Inkwell Beach, staying 10 feet above mean high tide and 15 feet from the dunes — a total of about one acre on Pay Beach, and one-third of an acre on Inkwell Beach. The raked rocks will be deposited along the toe of the bank. The rake will be pulled by a four-wheel tractor, operated by Mark Clements at a rate of $100 per hour, according to highway department supervisor Richie Combra. Mr. Combra estimated the raking would take about 3 hours, probably longer the first time. “It’s going to take some trial and error, but we’ll get it right,” he said. “We’re trying to find someone on the Island who has ability and time to do that,” conservation agent Liz Durkee told The Times on Wednesday. Ms. Durkee said interested parties, ideally with surveying experience, should contact her directly at town hall. Asked if the Martha’s Vineyard Commission would be able to provide that expertise, Ms. Durkee said that is unclear. It is still not clear who is picking up the tab. Financial and Advisory Committee (FinCom) member Maura McGroarty pointed out that the purchase of the rake was approved at town meeting after the budget was approved, so there’s no line item for the purchase and operation of the rake. 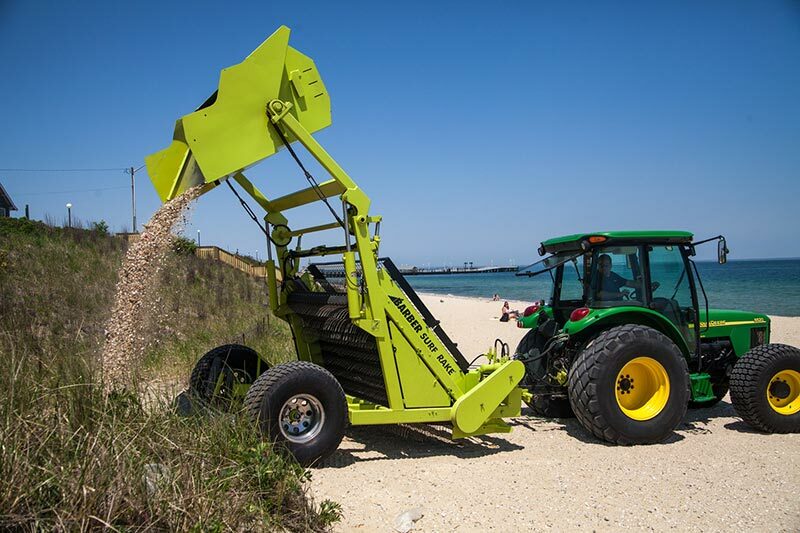 Since the beach rake movement began two years ago, Ms. Durkee has been attempting a delicate balancing act between beach rake advocates and the Massachusetts Wetlands Protection Act, which does not allow any activity on a beach that can cause erosion. Removing rocks, shells, and seaweed from a beach can potentially hasten erosion. The campaign for the beach rake sprang from public outcry over substandard beach nourishment that was dredged from under the Lagoon Bridge and placed on Inkwell and Pay Beaches in 2014. Although the sand had been tested and deemed acceptable by Massachusetts Department of Environmental Protection (DEP), it did not “bleach out” as predicted, and public outcry grew until the dredge spoils were removed that June. Last summer, dredge spoils from Little Bridge were used to fortify Pay Beach and Inkwell Beach. Although it was a clear improvement from the previous year, beach committee members still had issues with the rocky composition of the beach nourishment and its uneven distribution. This past winter, Mr. Seelig began the petition to put the beach rake on this year’s town meeting warrant. At that meeting, Dr. Jason Lew pointed out that only $1,000 of the town’s $28.4 million budget had been allotted to maintain the town beaches.